3 DV Leaders (green dots in upper right corner of Q4DV above) compared with each other and with Microsoft BI stack on this blog, as well as voted in DV Poll on LinkedIn. MQ4BI report actually contains a lot of useful info and it deserved to be used as a one of possible data sources for my new post, which has more specific target – Data Visualization Platforms. As I said above, I will call it Quadrant too: Q4DV. 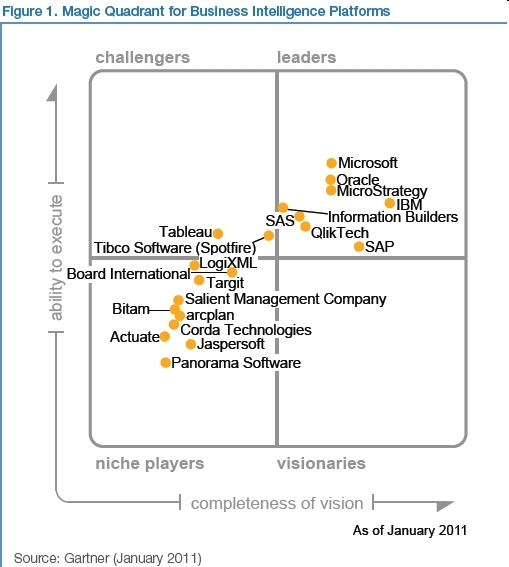 But before I will do that, I have to comment on Gartner’s annual MQ4BI. MQ4BI customer survey included vendor-provided references, as well as survey responses from BI users in Gartner’s BI summit and inquiry lists. There were 1,225 survey responses (funny enough, almost the same number of responces as on my DV Poll on LinkedIn), with 247 (20%) from non-vendor-supplied reference lists. Magic Quadrant Customer Survey’s results the Gartner promised to publish in 1Q11. The Gartner has a somewhat reasonable “Inclusion and Exclusion Criteria” (for Data Visualization Q4DV I excluded some vendors from Gartner List and included a few too), almost tolerable but a fuzzy BI Market Definition (based on 13 loosely pre-defined capabilities organized into 3 categories of functionality: integration, information delivery and analysis). I also partially agree with the definition and the usage of “Ability to Execute” as one (Y axis) of 2 dimensions for bubble Chart above (called the same way as entire report “Magic Quadrant for Business Intelligence Platforms”). However I disagree with Gartner’s order of vendors in their ability to execute and for DV purposes I had to completely change order of DV Vendors on X axis (“Completeness of Vision”). For Q4DV purposes I am reusing Gartner’s MQ as a template, I also excluded almost all vendors, classified by Gartner as niche players with lower ability to execute (bottom-left quarter of MQ4BI), except Panorama Software (Gartner put Panorama to a last place, which is unfair) and will add the following vendors: Panopticon, Visokio, Pagos and may be some others after further testing. I noticed that you didn’t include a number of data visualization vendors in this. Data visualization vendors and full BI providers are going to be a little different as one is going to specialize heavily on the data visualization side of things often being able to integrate with the BI providers mentioned above. 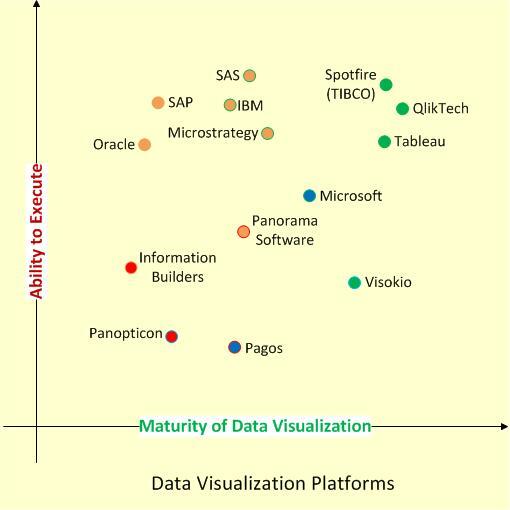 I mention this because companies like Dundas Data Visualization, iDashboard, or even component vendors like ChartFX, ComponentArt, Infragistics, or Telerik should be considered when breaking it down the data visualization/presentation layer aspect of BI. Cheers!